Don’t be frightened! Grammar is just the name given to a set of conventions underlying our use of language. If you wish to improve your grammar but don’t want to be burdened with having to memorize grammatical rules, we’re not going to do that here. The formal study of grammar may be an interesting part of linguistics, but it is not the best way to improve the fluency and precision of your writing. This might seem a somewhat unorthodox view, but it is based on the observation that most people are not seeking the technical names and the causes of these grammatical problems. What they are looking for is help in avoiding them and examples of good usage. It is also unlikely that anyone could develop a good sense of language-use by trying to learn the rules of grammar. This would be rather like learning to drive a car by studying a repair manual. A far more fruitful approach [in addition to practising your own writing] would be to read as much as possible. You can develop a sense of the rhythms and the nuances of a fluent prose style by reading the work of successful writers. However, if there are some points of grammar with which you regularly have difficulties, you should be prepared to clarify the issues. 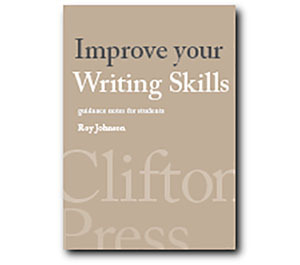 Get hold of a book which explains grammar at the level you require. [There are a number described in Further reading.] I am not going to deal with all the niceties of parts of speech and the relationship of clauses here, otherwise this book would be twice as long as it is. Some of the basic issues are dealt with as part of nearby sections, such as Punctuation and Sentences. But there are some very common problems which we can briefly examine here, partly because they are fairly straightforward, and partly because they are caused by grammatical weaknesses. Seeing these issues explained may help you to avoid mistakes. I have tried to explain the details involved with the absolute minimum of technical jargon. If the subject of a sentence is singular, then the verb form must be in the singular form as well. If the subject is plural, then the verb form must be plural. The shop [singular] opens at nine o’clock. On Thursdays the shops [plural] open late. then gradually drifts into the plural. The easiest solution to this problem is to make the subject plural and its verb plural as well. I always feel that a person has the right to know when they are dying. I always feel that people have a right to know when they are dying. Sometimes a singular noun is used to denote a plural or a collective thing – such as the government or parliament. Either the singular or the plural verb form may be used – but the important thing is to be consistent. The government prefers to let matters rest, but events may make them change their minds. The government prefers to let matters rest, but events may make it change its mind. The government prefer to let matters rest, but events may make them change their minds. Even skilled writers can make mistakes in the matter of case agreement. Sometimes the grammatical subject of the sentence may be singular, whilst its object appears to be plural. The most pompous monument of Egyptian greatness, and one of the most bulky works of manual history, are the pyramids. The famous grammarian [no relation, by the way] perhaps understandably trips himself up here. ‘The most pompous monument … is the pyramids’. Although there is more than one pyramid, the subject of the sentence (the term ‘monument’) is singular. A similar difficulty is created when a number of qualifying clauses are inserted after the start of a sentence, causing its author to believe that the case has changed. Finding Miss Vernon in a place so solitary, engaged in a journey so dangerous, and under the protection of one gentleman only, were circumstances to excite every feeling of jealousy. Scott wrote his novels so rapidly, it is not surprising that his attention has wandered here. The subject of this sentence is ‘Finding Miss Vernon’, so its verb and object should be ‘was a circumstance’. This might seem like absurdly simple advice, but many of the problems which are caused by a shaky understanding of syntax can be cured by following this pattern. The problems of word-order in a sentence can be illustrated by a famous advertisement singled out as a warning by Punch [the now-defunct satirical magazine]: ‘Wanted – armchair for old gentleman with sliding back and oak legs’. Obviously a more successful word order would be ‘Wanted for old gentleman – armchair with sliding back and oak legs’. Some of the most common problems connected with syntax are caused by two or three closely related factors. First, the sentence is often longer than it needs to be. One clause is tagged on after another until grammatical contact with its beginning is gradually lost. Second, the sentence very often starts with its verb or object, rather than its subject. Third, it might also start with a conjunction (‘although’, ‘because’) which are terms used to join separate clauses. What follows is an example taken from a student essay which exhibits all three problems [plus one or two more besides]. But if the harasser is not put in his place clearly and with strength immediately, (An action which doesn’t always work any way) then later reports it, again there seems a common problem. – Why did the victim allow it to go on for so long? These are the most common causes of grammatical confusion. The solution to this problem is to put the subject first, and keep sentences short. Keep them simple and direct. Unless you are confident, you should try to avoid starting sentences with words such as ‘Again’, ‘Although’, ‘But’, ‘And’, ‘Also’, and ‘With’. These are conjunctions which are normally used for joining together two or more separate clauses. For instance we might write ‘The event was still held, although it was raining’. But this might also be expressed as ‘Although it was raining, the event was still held’. The problem is that many people choose to start sentences with these connecting terms, but they often fail to realize that they are beginning in the grammatical ‘middle’ of their statement. They then carry on writing, imagining that they have already made clear the subject of the sentence. They are aware of the subject in their own minds, but they have not bothered to write it down. Variations in sentence construction may be used for emphasis and effect – particularly in such modes of writing as imaginative fiction, advertising, or personal correspondence. For any sort of formal writing however, elegant variation is probably best kept to a minimum unless you are quite confident that you have control over the structure of the sentence. Remember that speech and writing are two different forms of communication. Ungrammatical statements in speech are perfectly normal, but the same statements wouldn’t be accepted when written down. Avoid the use of a casual or conversational manner when writing, and do not string together clauses which are grammatically unrelated. Unless you are very confident, avoid using contractions such as ‘won’t’, ‘I’ll’, and ‘you’re’. These tend to promote a conversational tone. Many writers currently send themselves into grammatical convulsions trying to avoid the use of the masculine terms ‘him’ or ‘his’ when speaking of the general public. Not wishing to fall into the trap of writing ‘The reader will form his own opinion’, they use instead the very clumsy formula ‘The reader will form his or her own opinion’. Those striving for maximum political correctness will of course write ‘The reader will form her own opinion’ – thinking to jolt readers out of their complacent state of ignorance and to redress one historical injustice by perpetrating another. There is a very simple solution to this problem, and that is to use the plural, which is entirely appropriate when addressing or speaking of a number of people. Readers will make up their own minds. These are some of the most common causes of grammatical problems – but let me repeat a point made earlier: there are many other causes. Some of them are dealt with in the adjacent sections on Punctuation and Sentences, and others are discussed elsewhere in the book. For a more wide-ranging coverage of grammar you should look at some of the books in ‘Recommended Reading’. Let me also repeat that this section has not attempted to deal comprehensively with grammar as a subject. 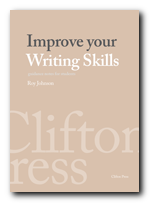 For reasons made given in the Introduction, this is an approach to improving writing skills which I am happy to leave to others.